My brother bought this book and showed me that he was reading it. I was so interested I got it from the library to read myself. I love knowing facts, being book smart I guess. A.J. Jacobs read through the entire Encyclopedia Brittanica and this book is about his quest, and his fulfilling it. It’s written like an encyclopedia itself, with notes on some of the things he’s read and what he thinks of them. Even though it’s written like an encyclopedia, it’s far from dry and boring. He still writes about his life including wife, brother, father, work, trying to get pregnant, attempting to join Mensa and be on Who Wants to Be a Millionaire etc…. I got into the “story” just like any other book, like a memoir, internally sighing or cheering as different things unfolded. Jacobs is also very funny. I found myself laughing out loud quite a bit actually. You have to admit that’s all pretty hilarious! The write up under Earth and Ectasy are pretty funny too. Jacobs makes quite a few cracks at celebrities too. I’ve learned quite a few facts in this book, I only wish I could remember them all. However I have found times throughout my own life when a fact I learned in the book came in handy. I think this is an awesome book and that A.J. 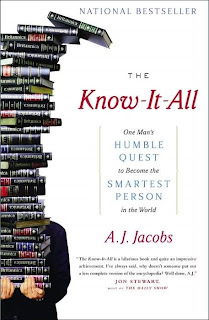 Jacobs is an awesome man to have undertaken this quest, which is anything but humble. It was a great read, possibly the best of the year.